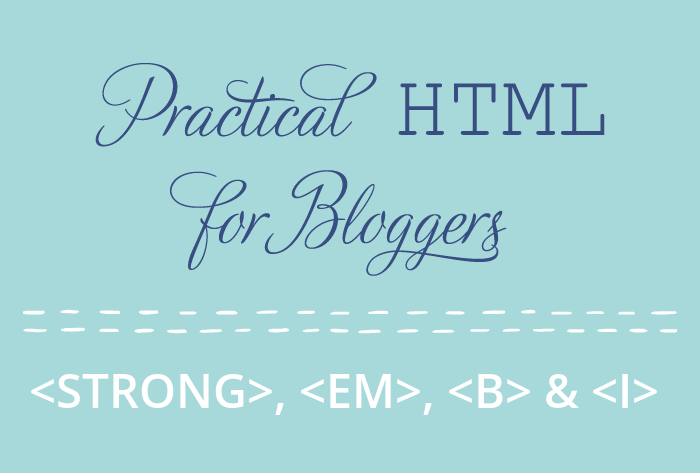 If you've been following along with this series, you've learned how to use HTML headings, HTML paragraphs, and HTML lists in your blog posts. You're pretty close to being able to write all of your posts in HTML, all the time! Today we're going to talk about the HTML elements <em> and <strong>, and their older siblings, <b> and <i>. Knowing about all four of these elements, and using them when appropriate, gives you maximum flexibility for styling and clarity. At the end of this post I'll show a few examples of how to put these different elements to creative use in blog posts. Choosing the right element from this group of four is a lot like choosing the right tone of voice to say something in; it's a bit subjective, and it's hard to use them "wrong" as long as you know what each element stands for. So let's see what they do! Use a <strong> tag to indicate very important text when it's not appropriate to use a heading element. Good candidates for the <strong> tag are warnings, disclaimers, and exclamations. Use an <em> tag when you want to emphasize a word or phrase. I use <em> a lot (see what I did there?) when I want to mimic the stresses I'd use if I were talking to you out loud. You've probably noticed that by default, the <strong> tag bolds the text, and the <em> tag italicizes it. If you're familiar with the <b> bold element and the <i> italic element, then you know that they bold and italicize text, too. Back in the early days of HTML, when web pages were mostly just text and blue links, the bold and italic tags were used to style text. Now that we have CSS to do our styling, many web developers feel that there's no reason to keep the bold and italic elements in the HTML specification. If you've talked to developers, you may have been told to never use <b> or <i> tags in your HTML. However, the W3C, the governing body of HTML, disagrees. Both <b> and <i> are in the HTML5 specification and will remain a part of HTML for the foreseeable future. Though they're not as important as the <strong> and <em> elements, they do come in handy in certain circumstances, and you should know how they work! The <b> tag bolds your text, but does not assign the text any special importance. Good uses of the <b> tag are product names in reviews or keywords in an educational post. The <i> tag italicizes your text, but does not give it any extra emphasis. It's good for marking up technical or scientific terms, and it's particularly useful if you blog in more than one language. I'll show you an example of how to style foreign-language text at the end of this post. Let's talk about <i>Tyrannosaurus Rex</i>. Let's talk about Tyrannosaurus Rex. That's all you need to know about <strong>, <em>, <b>, and <i> to start using them in your blog posts. But, if you want to try your hand at a little CSS, I can show you two examples of how to use some of these elements with style! For the sake of brevity I'm going to show the CSS styling the elements directly. You may need to add classes to the elements to style them the same way on your blog, depending on your template's CSS. DO NOT taunt a bear with a firecracker. One great use of the <i> italic tag is to highlight and clarify text in a foreign language. Let's say for example that you're a food blogger, and you cook the cuisines of the world. If you set all of your foreign-language food words with an <i> tag, you can use an HTML title attribute and a bit of CSS to help your readers. Those are just two examples to give you a taste of the infinite possibilities with these four useful elements! Next, learn about the HTML of images in Practical HTML for Bloggers - Images. Title cards for this series designed by the dazzlingly wonderful Jenna from Little Bit Heart.